Birthday Poems Are Also A Gift! Free happy birthday poems, including general birthday messages, daughter, brother, sister, granddaughter birthday wishes, funny birthday rhymes, birthday love poetry, baby's first birthday, 50th birthday, more. Do you know a really special person who warms your heart and lights up your life? This birthday poem in free verse is for that person. Here's a birthday wish with wide application. It's a birthday wish that will fit neatly on a card, and you can send it to just about anyone. Birthday poetry should be positive so it can be used for greeting card verse. This upbeat birthday verse is great for anyone, especially those who are concerned about getting older. You could title this birthday message, "For (name) on his/her (number of years) birthday. Attach this rhyming poem to the birthday gift to make it extra special. Greeting card poems vary with the personality of the recipient. This free verse birthday message is for someone very special. Those who prefer rhyming poems, however, would choose a different birthday wish from this page. Birthday wishes are always happy, but some people really want their poems to contain the words "Happy Birthday." This Happy Birthday poem is a birthday card verse that could apply to most people. Birthday poems can be written with a specific kind of person and birthday message in mind. This birthday verse is free verse birthday poetry for a person with a sunny disposition. It's greeting card poem sure to please the recipient. Is a guy who makes you laugh having a birthday? Send him this birthday poem. I wrote this for my husband, Karl. That's my man; that's my big boy. Who makes me laugh, because he can. Greeting card poetry would always consist of rhyming poems in the past, but now, there is more and more preference for poems that don't rhyme. This birthday verse, in free verse, wishes the birthday person a most memorable birthday! Birthday wishes often express affectionate messages for the birthday person, as this one does. Give this birthday verse, a rhyming poem, with a birthday gift or put it on a birthday card. Most of it's great; you had quite a blast! Birthday verse can be for people who are very close to you or for acquaintances. This free happy birthday message is for someone very special in your life. It's perfect for a birthday card verse. It could be a friend birthday poem or even mother birthday poetry. Many of our birthday card verses can be customized to the specific recipient. To customize the following happy birthday wish, replace the words "special one" in the first line with your own term, such as the person's name, or "Mother Dear," or "Son of mine," etc. I wish you all of life's best treasures. Birthday poetry can express the value of having the recipient in the sender's life, as this birthday wish does. Birthday poetry with a birthday gift or card will touch the heart of the birthday person. Rings my bell for all it's worth. You're the most special person of all! Birthday poems can express appreciation, as this birthday verse does. It's so easy to put this birthday poetry on a birthday e-card and send it, even if the birthday person lives halfway around the world. Birthday poetry can express appreciation, as this birthday wish does. Note that in this birthday verse as in the birthday messages Another Year and Perfect Birthday above, if more than one person is sending this birthday rhyme, then change "I" to "we," "I'm" to "we're," and "me" to "us." You're right at the front of the line. It's because you make everyone shine. You're a person I really respect and admire! This birthday poem is designed for one older man to send to another. I said to Karl, "Honey," women send most of the cards, and the age factor really limits the audience for this poem." Here it is anyway, for those of you to whom it applies. Does this belong on the funny poems page? Let me know. You're getting to be an old guy. I'm reminded of joys in our friendship I've found. I've been writing birthday poems in the form of limericks, to put in cards for friends. If you have a friend whose name rhymes with the names of my friends, you can use them in your cards. For example, your friend's name might be Kathleen, or Colleen or Celine, etc. Of good cheer she's the absolute queen! Birthday messages are often sent to family members. 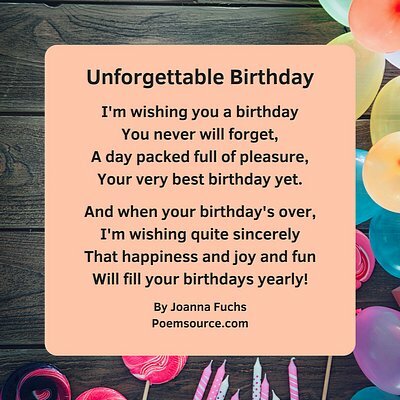 Although I wrote this daughter birthday poem in free verse for my own stepdaughter, Kim, it's a daughter birthday poem that you could use, too, if it fits your daughter. And one is my daughter! She'd be a bargain, I’d have bought her! Than there are stars in the sky. That helps me feel, I did fine. in my heart, for all of my time. A brother is a good thing to have, so let's not forget a brother birthday verse! You can customize this granddaughter birthday poem by substituting something like "pretty brown hair" for "pretty blond curls." We just can't resist her. Birthday messages can be specific to someone's age. Here's a first birthday poem for baby. Don't you dare frown or pout. It's really great to be fifty. And I still think you're nifty! on the Funny Birthday Poems page. There are lots of searches for a birthday prayer, so I wrote a birthday poem that is also a birthday blessing. If the person is "him," change "her" to "him." to access all of our greeting card poems. Happy Birthday Message or Poem! Write an original, personalized Happy Birthday Message or poem to your special person. You can send them a card with a link to your message or verse so they can see it online. Please note: YOUR ORIGINAL WORK ONLY posted only at Poemsource.com. Please DO NOT submit the work of someone else. Minimum 100 words; more is better, no limit. If your birthday wish, message or poem is too short, please add comments. Submissions are subject to approval and editing before being posted here at Poemsource.com. Your birthday verse will appear on a Web page exactly the way you enter it here. You can wrap a word in square brackets to make it appear bold. For example [my story] would show as my story on the Web page containing your story. Click below to see birthday verses from other visitors to this page.